I’m generalizing here, but I think there are two types of Turks: the friendly, pleasant, and hospitable ones; and the ones who are trying to sell you something. Honestly, Turks are a lovely people as a whole, but like any large group, there are some unwanted elements. In Turkey they usually fall into the category of aggressive salesmen. Granted, some of this is my own fault, given how non-confrontational I am. When Minnesota nice meets “let me take you to my cousin’s carpet shop,” painful awkwardness has a tendency to ensue. On our first trip to Istanbul, we were followed, nay stalked, by a “fisherman,” or a shop tout whose strategy involves helpfully ingratiating himself with tourists and leading them past – and into – the shop he actually represents. Because I have certain pushover tendencies, directions to a restaurant ended up with both of us trapped in a rug shop. Michelle may be small, but she was the one who was strong enough to extricate us. Lesson learned. Not that there is anything necessarily wrong with going to a shop and not buying. Some may even find this a little fun, although you’ll certainly be guilted for it, and it is very insulting not to honor an offer you’ve made, even if you thought you were unrealistically lowballing. If you stand up to guilt better than I and/or you’re interested in a rug, I suppose you could have at it. But I would offer one caveat: the good carpet shops run on referrals. You can always ask someone reputable or look it up. If the shop needs fishermen, they’re not a good shop. Bad shops have a nasty habit of shipping the incorrect thing, not shipping at all, or even stealing credit card numbers. In any case, Turkish friendliness and hospitality can be a double-edged sword when there are naive tourists waving dollars and euros about. But if you know what to expect, you can avoid being taken for a ride by disreputable hawkers and their annoying pitchmen. First things first. The scam artists congregate where the money is. That means the crushing mass of coach-bus tourists between Hagia Sophia and Sultanahmet mosque, and to a lesser extent, the Grand Bazaar, which relies more on subtle-as-a-slap-in-the-face pitchmen than smooth operators. So if you’re in the Hippodrome and you hear “do you need directions?” “what are you looking for?” or “can I help you find where you are going?” you should probably walk on without acknowledging anything. Firm “no”s are sometimes necessary, but eventually respected. A common fisherman scam is to wait for punters to walk out the exit of the Hagia Sophia and ask them whether they’re headed to the Blue Mosque. Of course many are. Conveniently, however, the Blue Mosque will be “closed for prayers,” but not to worry! You could while away some time having tea (and being aggressively sold unwanted rugs) with a helpful Turk. How authentic! 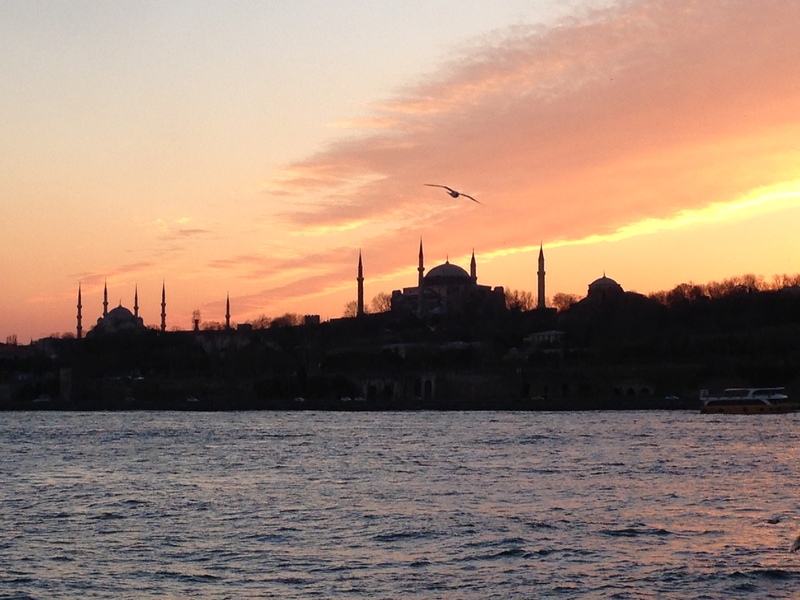 If someone tells you that the Blue Mosque is closed, there’s a good chance they’re not telling the truth. To be fair, it does close for prayer times, but unless it’s Friday at noontime, that won’t be a huge production. Just wait it out. Check out the awesome columns in the Hippodrome area. Take a five minute stroll to see the Sphendone. There’s plenty available to do. Another thing to note is that there are tourist police and a few tourist ombudsmen always out and about in the area. These are generally to be trusted, but the slick young men with no official uniform simply aren’t. Likewise, there are tourist guides who will hang out outside the Hagia Sophia and Blue Mosque. If they are displaying a tour guide license, they are indeed legitimate (feel free to inspect it; most wear them prominently on lanyards around their necks). They do cost money, but becoming a tour guide in Turkey is a rigorous process involving historical knowledge and language ability, so they are often worth it. I do find it quite irritating that there are those who take advantage of the history that Istanbul has to offer in this way. Then again, there is an element of this wherever tourists congregate, and being forewarned about the fishermen should be enough to nip it in the bud. There are a few other scams around, though the only one I’ve personally seen is the shoe-shine one, which we didn’t fall for. Oh, and taxis, but taxis here are almost universally to be shunned on simple avoidance-of-death grounds. On a more optimistic note, outside of the tourist hotspots like Sultanahmet, Hagia Sophia, Topkapi Palace, and Grand Bazaar, friendly people are probably just friendly. I’ve had some great spontaneous conversations outside of the tourist zones with people who were, as far as I could tell, simply interested in who we are, where we are from, and whether we like Turkey. So be social! Just be a little bit selective.